“Mormonism” is a term applied to the collective beliefs of the latter day saints. What is a Mormon is explained in their unique beliefs, demonstrated by their devout life style, and evidenced by their persecutions. The term Mormon originated with the Book of Mormon published by Joseph Smith in 1830. Joseph Smith claimed that through angelic calling and revelation he recovered and translated a record of the former inhabitants of the Americas —Native Americans. The record was published in 1830, as the Book of Mormon. It was given that name because it is an abridgement of the record of that people made by the Prophet Mormon. The latter day saints believe in the authenticity of this record. They do not believe that it replaces the Bible; but that it adds an additional testimony of Jesus; and it is the record of a people whom Jesus identified as “other sheep” that were of the house of Israel (John 10:16 ). A Jewish Prophet by the name of Lehi was commanded of God to lead his family out of Jerusalem in 600 BC. It tells of this people living in Central and North America , of their cities, and of their temples. Knowledge of such a people was never known in America until the work Antiquarians, in Central America by Stephens and Catherwood published in 1843. Two opposing doctrines can be false; but, only one can be true. No one can claim to be in possession of truth without an open mind and an insatiable desire for truth. Truth has no fear of investigation. “Study to shew thyself approved unto God, a workman that needeth not to be ashamed, rightly dividing the word of truth.” (2 Tim. 2:15) “Prove all things; hold fast that which is good.” (1 Thess. 5:21) We must be willing to lay our beliefs on the table and examine them; because before we can claim our beliefs are true, we must admit there is always the possibility of error. “To the law and to the testimony: if they speak not according to this word, it is because there is no light in them.” (Isa. 8:20) If you have an open mind and an earnest desire for spiritual truth, follow me through an examination of the beliefs of Catholic, Protestants, and Mormons. The term Mormon is not a homogeneous term. After the murder of Joseph Smith on June 27, 1844, the church split into three groups called the Strangites, Rigdonites, and Twelvites (later Brighamites). These are not appropriate terms; but, have been popularly used and form a means of distinguishing the different groups. Before we can understand succession in the Prophet Office claimed by the heads of the various churches, we must first understand the office of Apostle. In the office of Apostle there are four degrees. Only first and second degree Apostles are Prophets. Moses and Jesus were first degree Apostles. Joshua succeeded Moses as a second degree Apostle. Joseph Smith was ordained a first degree Apostle, Prophet, and Lawgiver, like Moses, Jesus, Peter, and others before him. This office is also referred to as First President. It stands at the head of the executive, judicial, and executive branches of the church. There can be no temporal ruling authority without the President (Doctrine and Covenants, 107:10, 33). Joseph claimed to have been ordained under the hands of Peter, James, and John, who held this office successively in the flesh after Jesus. As a Lawgiver, Joseph was empowered by God to give revelations and commandments to the people like Moses and Jesus before him. James J. Strang was called of God through Joseph and ordained at the hands of angels to this same high calling. As this is a singular office, only one person can hold it in the flesh at the same time. Elisha had to wait for Elijah to be translated and enter the chariot before he could be ordained to this same office held by Elijah. Jesus was ordained to this office under the hands of the Father (Heb. 5:5). 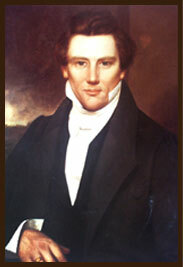 Several were ordained second degree Apostles and Counselors under both Joseph Smith and James J. Strang. With the First President they formed the First Presidency. Sidney Rigdon and others stood as Counselors in the Presidency. These were Prophets; but, were Counselors and administrators; and not Lawgivers. In the event of an interim between Lawgivers, the senior second degree Apostle can stand at the head; but, cannot give laws and commandments to the people. When James J. Strang was ordained a first degree Apostle and Lawgiver, Sidney Rigdon lost any right to stand at the head. Only the First President is empowered to stand at the head and give laws and commandments from God. The body of Christ (Church of Christ) can have only one head on the earth. The twelve Apostles were Ambassadors to the nations of the world. They held no ruling authority over the church in America. The Twelve were not Prophets; and held no authority from God to stand at the head. There were no fourth degree Apostles under Joseph and James. The Missouri gangs followed Joseph into Illinois, where they were able to get Joseph arrested on false charges. The Governor of Illinois placed Joseph under the protective custody of the state. On June 27, 1844 , the militia left; and the mob, with the help of the government, murdered Joseph and his brother Hyrum. Their murderers never spent a day in jail for this black deed. The Strangites were the first group that was organized after the death of Joseph Smith. On June 18, 1844 , Joseph wrote a Letter of Appointment in which he told of his forthcoming death; and appointed James to stand at the head of the people. It was mailed the next day from Nauvoo. The same hour Joseph died on June 27, 1844, in Carthage, Illinois, James J. Strang claimed an angelic ordination (the same as Joseph); as his successor in the Prophetic Office (although 400 miles away in Wisconsin). The prophecy of Joseph was fulfilled. The probability of James having any knowledge of the death of Joseph except through divine revelation is zero. Joseph wrote, “I have long felt that my present work was almost done, and that I should soon be called to rule a mighty host, but something whispers me it will be in the land of spirits, where the wicked cease from troubling and the bands of the prisoner fall off. My heart yearns for my little ones, but I know God will be a father to them, and I can claim face to face the fulfillment of promise from him who is a cove­nant keeping God, and who sweareth and performeth and faileth not to the uttermost. The Letter of Appointment arrived by regular course of mail on July 9, 1844; twelve days after the death of Joseph. It was properly recorded by the Post Office in Chicago and in Burlington, Wisconsin. The page for that date had been mysteriously removed from the Post Office record in Nauvoo. This was the first official news in Wisconsin that Joseph had been martyred. The letter is now in Yale University Library. The church is still known as the Church of Jesus Christ of Latter Day Saints. James J. Strang is the only man that claimed to be appointed by Joseph and ordained under the hands of angel(s). He fulfilled all the duties of a Prophet, Seer, Revelator, and Translator. In 1850, he translated the most sacred book of Scripture, the Book of the Law of the Lord. In 1854, James wrote, “As First President, I have regularly presided over the Church and took the direction of its affairs in all the world, according to the law of God. On June 16, 1856 , the US Steamer Michigan docked at Beaver Island. The captain called for James to come on board; as he had done in the past. This time two apostate Strangites were waiting on the dock. When he stepped on the dock, they shot him; and then went on board the Michigan where they were protected by government officers. 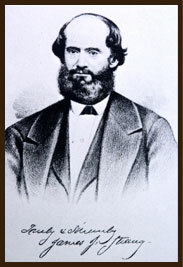 The surgeon from the Michigan pronounced the wounds of James mortal. His assassins were taken to Mackinac, given a mock trial, and released. James was taken back to Voree, Wisconsin, where he died on July 9, 1856. The saints were driven from the island and their property stolen. The Melchisedec Priesthood restored by Joseph and continued through James remains today; although the office of Apostle is gone. James ordained L. D. Hickey one of the Twelve, who ordained Samuel Martin a High Priest, who ordained Lloyd Flanders a High Priest, who ordained Samuel E. West an Elder. Sidney Rigdon had been ordained a second degree Apostle and Prophet under Joseph; as was Joshua under Moses. This office is one of administrator; and is not permitted to give laws and commandments to the people. He usurped the office of First President; and his followers became known as the Rigdonites. If James J. Strang had not been called and ordained of God to succeed Joseph in a higher office, Rigdon would have had a legitimate claim to stand at the head. He was not called of God through Joseph; and was not properly ordained to any higher office than Counselor. His followers later turned against his teachings and followed Bickerton. The Twelve were known as the Twelveites. They were not Prophets; but, were Ambassadors whose duty was to preach the gospel to the world. They held no ruling authority in America. The Kirtland council Minute Book (Page 72) contains the exact ordination of Brigham Young and the Twelve. God had previously admonished them for attempting to exercise authority over the people in America. “The Twelve are a Traveling Presiding High Council, to officiate in the name of the Lord, under the direction of the Presidency of the Church, agreeable to the institution of heaven; to build up the church, and regulate all the affairs of the same in all nations, first unto the Gentiles and secondly unto the Jews.” (Doctrine and Covenants, 107:33) Without the Presidency, they have no ruling power anywhere in the world. Brigham Young departed from the original doctrines of the church, developed many new doctrines, and fell back into some of the false doctrines of the Catholic Church. Brigham taught that Adam was actually the Almighty Father and that Eve was a wife from another planet. A later Apostle clarified one of his basic teachings on God: as man now is God once was, and as God now is man may become. It requires little knowledge of the Bible to understand the error of this doctrine. “For I am the LORD, I change not; therefore ye sons of Jacob are not consumed.” (Mal. 3:6) The doctrine that God was once a man like us is to bold an error to be worthy of a reply. A later group was organized by two apostate Strangites claiming that Joseph Smith’s son had a right to stand at the head because of his lineage; and organized a new church in Beloit, Wisconsin, in 1852. Joseph Smith’s son did not accept leadership of this group until 1860; when he was elected First President. This group originated as the ReOrganized Church of Jesus Christ of Latter Day Saints. The law of God does not provide for the Prophetic Office to pass from father to son. Young Joseph Smith was never appointed to succeed his father; and was never ordained to that office according to the law of God. In 1985, this group divided. The main stream group changed their name to the Community of Christ and joined the National Council of Churches (NCC) and the World Council of Churches (WCC). This caused a dramatic change in their doctrines. They were no longer strictly tied to LDS beliefs. Richard Price has attempted to hold members of the original RLDS church together. Other Mormon groups splintered off from these three original groups. This author accepts James J. Strang as a Prophet of God and successor to Joseph Smith. Of all those who claimed to succeed Joseph, only the teachings of James are in full agreement with those of Joseph and the Bible. All references to LDS doctrine in this article are to those of Joseph Smith and James J. Strang; but, not necessarily to those of the other LDS groups. Unlike Catholic and Protestant churches, Mormon Beliefs originated with revelations from God. Their doctrines on God and Jesus are diametrically opposed to Catholic and Protestant doctrines that are based on the Babylonian Trinity. Their beliefs on living according to the will of God go far beyond those of catholicity. It is the only Christian religion that perfectly agrees with the Bible (to the extent it has been translated correctly). Its doctrines conform entirely to those taught by Jesus, the Apostles, and the Prophets of old. Before we can fully understand the doctrines of the latter day saints, it is requisite to understand what happened to the original Christian religion. Constantine violated this law by standing at the head of the Christian church while he was an unbaptized, pagan Roman Emperor. He was not baptized until on his deathbed. The holy Melchisedec Priesthood is required for any person to enter the kingdom of God. John the Baptist was a Priest of the Levitical Priesthood; but, only held divine authority to baptize with water. “I indeed baptize you with water unto repentance: but he that cometh after me is mightier than I, whose shoes I am not worthy to bear: he shall baptize you with the Holy Ghost, and with fire.” (Matt. 3:11) Jesus was called and ordained to the Melchisedec Priesthood with divine authority to baptize with the Spirit. This mystery of Babylon was readily acceptable among the pagans; but, had Jesus taught such a doctrine, the people would have been justified in rejecting Him. No ghost or spirit can beget the seed of man upon woman. If such is true, no man could be sure who fathered his children; as Satan and his spirits were loosed upon the earth (Rev. 12:7-9). Constantine changed the Sabbath to “the venerable day of the sun.” The Sabbath was given by God to man as a perpetual law; and as a sign between Him and the people of God forever. “Wherefore the children of Israelshall keep the sabbath, to observe the sabbath throughout their generations, for a perpetual covenant. It is a sign between me and the children of Israel for ever: for in six days the LORD made heaven and earth, and on the seventh day he rested, and was refreshed.” (Ex. 31:16, 17) Jesus did not change the Sabbath. The Apostles did not change the Sabbath. The early Christians did not change the Sabbath. The pagan Roman Emperor Constantine changed the Christian Sabbath to honor the sun god. Constantine adopted all of the pagan doctrines, rites, institutions, and festivals by giving them Christian names. Christmas is one of the most honored Christian holy days. Yet, it did not originate with the Christians. It was a pagan holiday that celebrated the birth of the sun god. After December 25, the days grew longer in Rome. Biblical scholars agree that Jesus was most likely born in the spring. True latter day saints do not accept the doctrines of man that were invented by Nimrod, passed down to Greece and Rome, adopted by Constantine, inherited by Christians through tradition, and accepted by most presumed Christian churches. Martin Luther was the first to realize a Reformation of some of the evil practices of the Catholic Church. He could not, though, turn a piece of clay into gold. He could improve it; but without revelation from God, without the holy priesthood, it remained the work of man. Others could do not better. Some understood that none had been baptized for hundreds of years after baptism was changed to sprinkling. Others understood the true Sabbath. But, none could restore the original priesthood of God and the gospel. John the Revelator told us that the Church of Christ, the holy priesthood, and the gospel would be taken from the earth for 1260 years. This could only begin with the last form of the beast—Papal Rome in 570 AD (Rev. 13:11, 12). Exactly 1260 years later on April 6, 1830, Joseph Smith organized the Church of Christ in accordance with the freedom of religion provision of the Constitution. Restoration of the Melchisedec Priesthood by Joseph Smith is a corner stone of LDS beliefs. When Joseph Smith was only fifteen years old (1820), there was a great excitement and controversy among the various churches. Joseph had only about a third grade education; but, had read the Bible and the admonition of James (1:5) to “ask of God.” He retired to a field and called upon God to answer which of all the churches was true. “I saw a pillar of light exactly over my head, above the brightness of the sun, which descended gradually until it fell upon me. “It no sooner appeared than I found myself delivered from the enemy which held me bound. When the light rested upon me I saw two Personages, whose brightness and glory defy all description, standing above me in the air. One of them spake unto me, calling me by name and said, pointing to the other–This is My Beloved Son. Hear Him! “My object in going to inquire of the Lord was to know which of all the sects was right, that I might know which to join. No sooner, therefore, did I get possession of myself, so as to be able to speak, than I asked the Personages who stood above me in the light, which of all the sects was right (for at this time it had never entered into my heart that all were wrong)–and which I should join. Joseph claimed that he was later ordained under the hands of Peter, James, and John; who stood at the head of the Melchisedec Priesthood successively after Jesus. He was ordained an Apostle, Prophet, and Lawgiver of the Melchisedec Priesthood the same as Moses and Jesus before him. Holding this highest office he was empowered by God to preach the gospel, administer its ordinances, and organize the kingdom of God on the earth. The church was organized with Apostles, Prophets, High Priests, and Elders; as it had been under Jesus. Joseph Smith taught the fountain of spiritual life is revelation. Joseph wrote, “We believe all that God has revealed, all that He does now reveal, and we believe that He will yet reveal many great and important things pertaining to the Kingdom ofGod.” The God of Abraham, Isaac, and Jacob is a living God who always communicated with His people, when they were worthy. The critical importance of revelation is demonstrated in at least four ways. First, it is impossible to have faith in God and know God without personal revelation. “For what man knoweth the things of a man, save the spirit of man which is in him? even so the things of God knoweth no man, but the Spirit of God.” (1 Cor. 2:11) Without faith in the God of Israel, no one can enter the kingdom of God. Second, every minister of God must be called by the spirit of prophecy. “And no man taketh this honour unto himself, but he that is called of God, as was Aaron.” (Heb. 5:4) Aaron was called by a revelation from God to Moses; and ordained by Moses who held higher office in the holy priesthood. The Apostle Paul told his son Timothy, “Neglect not the gift [of the priesthood] that is in thee, which was given thee by prophecy, with the laying on of the hands of the presbytery.” (1 Tim. 4:14) Third, all of the gifts of the Holy Ghost—promised to every saint of God—are possible only through revelation. “10 And I fell at his feet to worship him. And he said unto me, See thou do it not: I am thy fellowservant, and of thy brethren that have the testimony of Jesus: worship God: for the testimony of Jesus is the spirit of prophecy.” (Rev. 19:10) Without revelation there can no faith in God, no ministers of God, and no salvation. Without revelation man is no better than the beasts of the field. He knows not what tomorrow brings. Why was there no warning from God of the great Indian Ocean Tsunami? “24 And they [the Jews] shall fall by the edge of the sword, and shall be led away captive into all nations: and Jerusalem shall be trodden down of the Gentiles, until the times of the Gentiles be fulfilled. 25 And there shall be signs in the sun, and in the moon, and in the stars; and upon the earth distress of nations, with perplexity; the sea and the waves roaring; 26 Men’s hearts failing them for fear, and for looking after those things which are coming on the earth: for the powers of heaven shall be shaken. …32 Verily I say unto you, This generation shall not pass away, till all be fulfilled.” (Luke 21) The times of the Gentiles was fulfilled in 1967, after the six day war. Biblical generations are forty years. The God of Abraham, Isaac, and Jacob (Ex. 3:15 ) is a living God. Man was made in the image and likeness of God. If you want to know what God looks like, just look in the mirror. Although man lost his divine character, the resemblance is still reasonable. God walked with Adam and Eve in the Garden of Eden. Abraham mistook Him for a man and invited Him into his tent to eat; and offered to wash His feet (Gen. 18). Jacob worshipped the same God. After wrestling with Him, he tells us that he saw God face to face (Gen. 32:24, 28, 30). Moses conversed with God face to face, as a man converses with a friend (Ex. 33:11). Moses wanted to see God in all His glory. God told him that no man can look upon the face of God in all His glory and live. God did allow Moses to see his back parts in all His glory (Ex. 33:22, 23). Moses, Aaron, Nadab, Abihu, and seventy of the elders of Israel saw God (Ex. 24:9, 10). The appearance of God was that of a man, when He appeared to Ezekiel (Ezek. 1:26, 27). It is easy to understand how a correct knowledge of God was passed from Adam to Abraham. Abraham knew Noah. Noah’s father knew Adam. But, alas, this knowledge was soon lost after Constantine. When Constantine adopted the pagan Trinity in place of the God of Israel, the mysteries of Babylon could only be applied in name only. The terms Father, Son, and Holy Ghost were easily adapted to the pagan Trinity. The doctrine did not originate in Israel; but, in Babylon by King Nimrod; and was passed down through Greece and Rome to Constantine’s Catholic Church. The Creed of St. Athanasius defines to whom the Trinitarian creed was directed, “Whosoever will be saved, before all things it is necessary he hold the Catholic faith.” This Trinity makes such declarations as, “we worship one God in Trinity, and Trinity in Unity. …The Father incomprehensible, the Son incomprehensible, and the Holy Ghost incomprehensible. …So likewise the Father is Almighty, the Son Almighty, and the Holy Ghost Almighty. …The Father is made of none; neither created, nor begotten. The Son is of the Father alone; not made, nor created, but begotten. The Holy Ghost is of the Father and of the Son; neither made, nor created, nor begotten, but proceeding. …And in this Trinity none is afore, or after other; none is greater, or less than another. …He therefore that will be saved, must think of the Trinity.” This creed makes the Father the first entity, the Son second, and the Holy Ghost third; and yet declares none is afore or greater than another. Let us test this creed against the Bible. Jesus always spoke of God as an identity separate from Himself. “But I would have you know, that the head of every man is Christ; and the head of the woman is the man; and the head of Christ is God.” (1 Cor. 11:3) “Ye have heard how I said unto you, I go away, and come again unto you. If ye loved me, ye would rejoice, because I said, I go unto the Father: for my Father is greater than I.” (John 14:28) Clearly God and Jesus are not the same identity. God alone has immortality. He has neither a beginning, nor an end. “That thou keep this commandment without spot, unrebukeable, until the appearing of our Lord Jesus Christ: Which in his times he shall shew, who is the blessed and only Potentate, the King of kings, and Lord of lords. Who only hath immortality, dwelling in the light which no man can approach unto; whom no man hath seen, nor can see: to whom be honour and power everlasting. Amen.” (1 Tim. 6:14-16) Eternities to us are as moments to Him. A thousand years is as a day. Jesus had a beginning; and was the beginning of this creation—the only begotten of the Father in this creation. Jesus lived as a spirit like us before His birth into the world, He died, and He was raised from the grave by the Father. Through perfect knowledge, God is able to save every one of his creatures. “Are not two sparrows sold for a farthing? and one of them shall not fall on the ground without your Father. But the very hairs of your head are all numbered. Fear ye not therefore, ye are of more value than many sparrows.” (Matt. 10:29-31) Without a perfect knowledge of God, man cannot exercise perfect faith in Him to salvation. God alone has omnipotence. God is the superior and governing force over the entire Universe. “Which in his times he [Jesus] shall shew, who is the blessed and only Potentate, the King of kings, and Lord of lords.” (1 Tim. 6:15) Jesus has dominion over only a speck amid all the worlds and creations in the Universe. Jesus was the only spirit brought forth by God. “In this was manifested the love of God toward us, because that God sent his only begotten Son into the world, that we might live through him.” (1 John 4:9) He is not Almighty GOD; but, He is the God of this creation. Some have been led to believe through the doctrines of Constantine that Jesus was God. GOD cannot be alien to His own kingdom. The Father was speaking from heaven, the Son was rising up out of the water, and the Holy Spirit was descending upon Jesus. It is not possible that these three different entities, originating at different times and in different ways, and in three different places at the same time can be one and the same identical person—GOD. GOD is one and not three. God holds all authority in the Universe. The Father “is the blessed and only Potentate, the King of kings, and Lord of lords.” (1 Tim. 6:15) It would certainly not be necessary for God to receive authority from anyone; much less Himself. “21. She was once the Apostolic Church; the Lamb’s wife; but when she lost the Apostolic Priesthood, and went off in an unholy union with the Kingdoms of this world as her Lord, she became what the Angel declared her to be, a whore; as all her daughters, prostituting themselves to the various national governments, without ever being lawfully joined to Christ are only harlots. “22. To make their Creeds as ridiculous as they are infidel; false as they are heathenish; Catholics teach that Christ’s mother is the “Mother of God;” as though God was begotten by himself, on a creature of his hands, that he might be eternally begotten. “23. And Protestants, not willing that Catholics should monopolize all the folly and all the falsehood, have invented, or borrowed from their mother, the doctrine of an infinite atonement, by means of infinite sufferings in the crucifixion of one of these three gods. “24. And, as by their faith, these three gods are one and the same god, it follows that the Lord God Almighty, uncreate, incomprehensible, and eternal, became a Priest unto himself, and offered himself a sacrifice unto himself, to make propitiation unto himself for sins against himself, and became a mediator between himself and his rebellious creatures; and has risen from the dead, though he alone hath immortality, and ascended on high, where he has received all power from himself, and sat down at his own right hand; where, with his human body, flesh and bones, and all that pertains to the perfection of man’s nature, raised to immortality and everlasting life, he ‘is the express image of the invisible God,’ (Col. i, 15. 2d Cor. iv, 4,) ‘and the express image of his Father’s person,’ (Heb. 1, 3,) who has not any such body or any part of it, and is nevertheless the same identical person with himself. The Catholic Church claims their divine authority comes through a succession of popes beginning with Peter. Peter was an Apostle and not a pope. The successor of an Apostle is an Apostle. History attests the first Pope in Rome was not until 570 AD. Since they make no claim to the Melchisedec Priesthood, their followers have no claim to the kingdom of God. The twelve Apostles were inferior to Jesus in authority. How can a bishop called by the vote of man be superior to Jesus? Martin Luther broke with the Catholic Church in the sixteenth century. Had the Catholic Church held divine authority, they used it to excommunicate him. As they held no such authority, Luther had no fountain of authority to draw from. His resolution of this dilemma was to form a new gospel: man can be saved by faith alone. “But though we, or an angel from heaven, preach any other gospel unto you than that which we have preached unto you, let him be accursed.” (Gal. 1:8) Again, without the Melchisedec Priesthood none can enter the kingdom of God. No man can assume authority on the basis of another holding such authority. Jesus was ordained to the same royal priesthood as Moses; yet the ordination of Moses had no effect on the ordination of Jesus. “Beginning from the baptism of John, unto that same day that he was taken up from us, must one be [individually] ordained to be a witness with us of his resurrection.” (Acts 1:22 ) Since these ministers make no claim to the Melchisedec Priesthood, their followers cannot be members of the kingdom of God . Joseph Smith was called by revelation of God and ordained an Apostle, Prophet, and Lawgiver by angelic administration—the same as Moses and Jesus before him. He restored all of the offices of the Melchisedec and Levitical Priesthoods. Before his death, he wrote James J. Strang, told him of his impending death, and appointed him (according to the law, Doctrine and Covenants, Sec. 43) to stand at the head of the people. At the same hour Joseph was martyred, James J. Strang (400 miles away) was ordained under the hands of angels, the same as Joseph, to stand in the same office at the head. There are only two orders of the priesthood noted in the Bible. The Melchisedec Priesthood is a priesthood of an endless life and administers to the spiritual affairs of the people. It existed as the priesthood of the Sons of God from Adam to Melchisedec. In honor of Melchisedec—and to reduce the use of the name of God—it was changed to the Melchisedec Priesthood (see Heb. 7). The Aaronic or Levitical Priesthood was instituted in the days of Moses to administer the added temporal law. Satan began his attack on the Church of Christ at an early time (Rev. 12:3, 4). He destroyed the Church of Christ (Rev. 12:5, 6, 14). He then attacked the holy priesthood (Rev. 12:17). Finally, he destroyed every true Christian (Rev. 13:5-7). Not one person was to enter the kingdom for 1260 years (Rev. 13:5, 7). The final form of the beast of Revelation (Rev. 13:3; 17:9-11) was Papal Rome, established in 570 AD. Even knowledge of the holy priesthood was lost among professed Christians. Joseph restored the Melchisedec Priesthood with the same offices that Jesus had organized the kingdom almost two thousand years earlier. “And he gave some, apostles; and some, prophets; and some, evangelists [High Priests]; and some, pastors [Elders] and teachers; For the perfecting of the saints, for the work of the ministry, for the edifying of the body of Christ: Till we all come in the unity of the faith, and of the knowledge of the Son of God, unto a perfect man, unto the measure of the stature of the fulness of Christ.” (Eph. 4:11-13) Have we all “come in the unity of the faith”? These officers are required “for the work of the ministry” and “for the perfecting of the saints.” None can enter the kingdom of God; except through their administration. “And I will give unto thee the keys of the kingdom of heaven: and whatsoever thou shalt bind on earth shall be bound in heaven: and whatsoever thou shalt loose on earth shall be loosed in heaven.” (Matt. 16:19) Through revelation from God, Joseph Smith and James J. Strang organized the kingdom in the latter days with these same officers. The offices of Apostle, Prophet, and High Priest have been lost due to the disobedience of the saints. The kingdom of God continues when there is at least one active Elder remaining to administer the saving ordinances of the gospel. James J. Strang, in his Pastoral Letter of January 21, 1847, wrote, “I desire, therefore, that all the saints, individually, may participate in the bonds of union, the fellowship with the Father, and his Son Jesus Christ, and may not rest satisfied, without knowing for yourselves the things that pertain to the kingdom of God, and that you be no longer conformed to the world, but transformed by the indwelling of the Holy Spirit, and the renewing of your minds, and turned from darkness to light. Wait for and patiently receive the word of God, which shall be as a shining light unto you; then will you be enabled to see and to walk in the path of duty. Abraham, whom God covenanted that out of his loins would come the elect people of God, was commanded to take his family, leave his home, journey in the wilderness, and be separate from the Gentiles. AfterIsrael had spent four hundred years as captives in Egypt, they were delivered by Moses and again became a separate people. The people were first gathered to Kirtland, Ohio. Next, God established Independence, Missouri, as the center stake for the gathering of the saints. When they failed (as a whole) to gather and abide by all the laws of God, they were driven from Illinois by mobs under the leadership of the Governor of Missouri, who had issued an extermination order against the Mormons based solely on religious discrimination. After fleeing Missouri, God established Nauvoo, Illinois, for the gathering of the people. Again, the people failed to gather; and Joseph was martyred. A new gathering place was established by God through Joseph Smith in his Letter of Appointment to James J. Strang. The saints were to gather to Voree (near Burlington), Wisconsin. This was given as a garden of peace, if the saints would live entirely by the will of God. The people failed; and the gathering was moved to Beaver Island in northern Lake Michigan . Persecution returned. The residents of the area were of the lowest moral character. Their primary trade was selling Indian Whiskey to the Indians. Once again, the Gentiles failed to live by the will of God. Two apostates from among their own people, with the help of officers of the U. S. Government and the US Steamer Michigan, shot James. His murderers were taken back to Mackinac, given a mock trial, and released. James was taken back to Voree where he died on July 9, 1856 . The saints were driven from the island and their possessions were stolen. Jesus prophesied of when the times of the Gentiles would be fulfilled (ended). “24 And they [Jews] shall fall by the edge of the sword, and shall be led away captive into all nations: and Jerusalem shall be trodden down of the Gentiles, until the times of the Gentiles be fulfilled. …32 Verily I say unto you, This generation shall not pass away, till all be fulfilled.” (Luke 21) This prophecy was fulfilled after the six day war in 1967. Biblical generations are forty years. Rather than the Gentiles being converted and becoming a branch of Israel, they rejected the gospel twice; and face an awful desolation. “This we offer to the saints as the home of the poor and the asylum of the oppressed. Here we propose to share each other’s joys, and each other’s sorrows; each other’s toils, and each other’s possessions: and to teach mankind that LOVE and TRUTH WINS WITH peace and sweetness, what FORCE and FRAUD labors in vain to COMPEL. Here we intend to gather a COMMUNITY WHO SHALL BE EQUAL IN THEIR TEMPORAL THINGS: WHO SHALL DO TO OTHERS AS THEY WOULD BE DONE BY: AND WHO SHALL LOVE THEIR NEIGHBORS AS THEMSELVES. HERE SALVATION SHALL BE PRESENT, and the GOSPEL A PRACTICED REALITY. HERE PEACE SHALL REIGN. The latter day saints were persecuted everywhere they gathered because their devout life style conflicted with that of the lower moral class that also settled on the western frontier. The Book of the Law of the Lord was the single most important book of Scripture. It is noted by name over twenty times; and as the law of God hundreds of more times. It was written by the finger of God and kept in the Ark of the Testimony. Public copies of those parts of the law that applied at that time were distributed among the people. The Book of the Law was held to sacred to fall into the hands of the Gentiles. Before the Babylonian captivity in 588 BC, the Ark of the Testimony was hid. Public copies were destroyed. One copy, though, was brought to America by a Jewish Prophet in 600 BC, was recovered by Joseph Smith, and later translated by James J. Strang in 1850. The third commandment is to “Remember the Sabbath day, to keep it holy… the Lord thy God blessed the seventh day and hallowed it: thou shalt keep it holy unto him, that thou forget not the Law.” (Book of the Law, p. 22) The seventh day Sabbath was kept from Adam to Jesus, by the Apostles after Him, and by the early Christians. It remained until the unbaptized, pagan Roman Emperor Constantine, in the early fourth century, changed it by the power of Rome to “the venerable day of the sun.” Most Christians have blindly followed the edict of man, without challenging the validity of his action. We were created as spirits by Jesus before the foundation of the earth. “Whereupon are the foundations thereof fastened? or who laid the corner stone thereof; When the morning stars [the first created spirits] sang together, and all the sons of God [spiritual saints] shouted for joy?” (Job 38:6, 7) Adam and all mankind were first created spiritually. The spirit of every person is eternal. When man dies, His spirit, being eternal, lives on; and is taken back to Jesus for judgment. “Then shall the dust return to the earth as it was: and the spirit shall return unto God who gave it.” (Ecc. 12:7) The spirits of man then reside either in the bosom of Abraham (with saints of God), or with the spirits in prison (inappropriately termed hell) to await their resurrection. “23 And in hell he lift up his eyes, being in torments, and seeth Abraham afar off, and Lazarus in his bosom. 24 And he cried and said, Father Abraham, have mercy on me, and send Lazarus, that he may dip the tip of his finger in water, and cool my tongue; for I am tormented in this flame. …26 And beside all this, between us and you there is a great gulf fixed: so that they which would pass from hence to you cannot; neither can they pass to us, that would come from thence.” (Luke 16) Those who did not live by the good in life must suffer the mental anxiety of knowing what could have been theirs. This life is like a snap of the fingers compared with eternity. The seven commandments which hang on loving your neighbor are known by all mankind. The first doctrine of the new Catholic Church was, “This is the Catholic Faith; which except a man believe faithfully, he cannot be saved.” (Creed of St. Athanasius) Not so! All men who suffer through this mortal existence will receive an immortal, physical body. They will share in the grace of God. “For therefore we both labour and suffer reproach, because we trust in the living God, who is the Saviour of all men, specially of those that believe.” (1 Tim. 4:10) All men will come forth either in the resurrection of the just, or a thousand years later in the resurrection of the unjust. In our spiritual estate we live as one being spirits for eternity, in death we live as two (bosom of Abraham or hell) awaiting the resurrection, and in eternity we live as three (celestial, terrestrial, and telestial glories). After the Sabbath of Creation and mortal man comes to an end, we enter eternity. Truly, the God of Abraham, Isaac, and Jacob that was taught by Joseph Smith and James J. Strang is not a respecter of person; but, is loving, merciful, gracious, and abundant in goodness. He is also a God of justice and judgment. Although God built His law upon the foundation of love, we cannot imagine for a moment that He can either look upon sin with the least degree of allowance, or that He will not punish the disobedient. Opportunity for life and goodness does not end at death; but, only begins again. We can only live in a particular glory, if we live by the law of that glory. Jesus said of John the Baptist, “For I say unto you, Among those that are born of women there is not a greater prophet [preacher] than John the Baptist.” (Luke 7:28) The man who baptized Jesus with water was martyred in 27 AD, after admonishing King Herod Antipas of his great sin in killing his own wife and marrying Philip’s wife. James the Greater was the first Apostle to be martyred by Rome in 40 AD. One by one the Apostles were martyred. Only John remained, whom Jesus allowed to tarry on the earth until His return (John 21:22 ). Exactly forty years after the Jews had Jesus martyred by Roman law; the Roman Army under the leadership of Titus fell upon Jerusalem. The terrifying account is found in The Complete Works of Josephus, Wars of the Jews, Chap. 9. Writing only of Jerusalem, Josephus tells us, “Now the number of those that were carried captive during this whole war was collected to be ninety-seven thousand; as was the number of those that perished during the whole siege, eleven hundred thousand (11,000,000).” Many thousands of Gentile Christians were martyred under the sword of Rome. The devout life style of the latter day saints and their Biblical beliefs caused them the most severe persecutions. They were persecuted everywhere they tried to settle. They gathered to Independence, Missouri. The Governor of Missouri actually issued an extermination order against the Mormons based solely on religious discrimination. Many were killed and the rest were robbed of their possessions and sent away in the middle of winter. Nauvoo, Illinois was given by God as the gathering place for the saints. Joseph Smith was murdered on June 27, 1844 , while in the protective custody of the Governor of Illinois. After Brigham Young rebelled against the authority that God had set in the church, and failed to gather to Voree, they were driven from Nauvoo under the worst conditions. When the saints gathered to Beaver Island in Northern Lake Michigan, they again fell under severe persecution. The citizens of the area dealt primarily in fish and selling whiskey to the Indians. James J. Strang strongly prohibited the sale of whiskey to the Indians in accordance with the laws of land. He was finally shot by two apostate saints with the help of government officials aboard the US Steamer Michigan. The captain of the Michigan requested James to come on board. When he stepped on the dock, Wentworth and Bedford shot him. He was carried back to Voree, where he died on July 9, 1856 . The US government was involved in the murders of Joseph Smith, Hyrum Smith, James J. Strang, and many of the saints. Their murderers never spent one day in jail. These were black and bloody pages in the history of a government that pretended equal protection under the law. An abridged account of these persecutions was published in the official church newspaper, The Northern Islander, on June 5 to 20, 1856. “The 6th day of April, 1830, the Church of Jesus Christ of Latter Day Saints was organized at the town of Fayette, in the State of New York, consisting of only six members, two of whom, Joseph Smith and Oliver Cowdery, were Elders; being the only true and living Church existing by the commandment of God on earth. “Almost immediately after the organization of the Church, the Saints commenced assembling at Kirtland, Ohio, for a temporary rendezvous; but at the same time a few went up to Missouri, to locate a permanent residence, and selected the site of Independence, Jackson county, as their future home, and commenced a settlement there. “Agreeable to a commandment which God gave them, they purchased large quantities of lands of the government of the United States, and paid the full price therefore to the officers of the United States, the ministers of your predecessors in office. Upon these lands our breth­ren, the saints, made extensive settlements, continually showing themselves the most indus­trious, peaceable and law-abiding citizens of that section of the country. “At the time of which we speak no one among them was accused of any violation of the law, or of a want of at­tachment to the constitution and government of the United States, or of the state of Missouri. “Notwithstanding these facts, and the legal rights of our brethren, a numerous meeting of cit­izens of Missouri was held at Independence, in Missouri, which decreed the expulsion of the saints from that part of the State. This meeting issued a manifesto to the public, giving to the world the reasons for banishing from their neighborhood a numerous class of citizens; the entire church of the Latter Day Saints. “In giving these reasons they stated that our religious senti­ments and domestic habits were incongruous with theirs, and that it was necessary for their happiness that our brethren should leave; and as the grievances of which they complained were not recognized by the laws, and the saints had not violated any existing law whereby they were subject to regular prosecution in the courts, therefore they would take redress into their own hands, and compel us to leave the country, peaceably if they could, forcibly if they must. This decree was carried out by the expulsion of the saints from Jackson Co., Missouri. “They then settled in various counties on the north side of the Missouri river, but continual collisions took place, till finally they were banished from the State by authority of a mandate guilty issued by Lillburn W. Boggs, acting Governor, distinctly commanding that the saints (in de­rision called Mormons) be banished from the State, or exterminated. We are perfectly aware that this mandate of the acting Governor was unauthorized by the law, and in violation of the constitution of the State of Missouri. “But the Legislature of that State, in failing to impeach the Governor, and by appropriating the money to pay the expense of executing his order, has affirmed and adopted the act as the crime of the State. In accomplishing this expulsion ten thousand persons, men, women and children, were plundered of their possessions, exiled from their homes, and driven in destitution, hunger, and want, in mid winter, to a distant land, passing much of the way in the midst of hostile foes, who not only refused them shelter and food, but kept them in continual danger. “Many were separated from their families and incarcerated in prison, whence, after long detention, they escaped only by paying large sums of money to prison keepers, judges and lawyers, as the price of their enlargement. Besides a feeble few, who, after learning that their perse­cutors were without compassion, were slain while defending their wives, their children and their firesides; eighteen persons, unarmed, and engaged in the worship of God, were murder­ed unresisting, and in cold blood, in the early part of these persecutions; one of them a mere child, who died mixing together the words of his prayer to God, and his supplication for mer­cy from his murderers; another, an old man, bowed down with suffering and sorrow, scarred with the wounds he had received fifty-seven years before in defense of American liberty and American independence; all yielding up their lives for the name of Jesus, and the witness of the gospel. Others, at different times, shared the same fate; how many, we know not. “Subsequently the saints settled in great numbers in the State of Illinois, and built up, besides many villages, the city of Nauvoo, at one time the most populous city in that State. At their first settlement they were kindly received; but after building up flourishing towns, be­coming numerous as a religious people, and strong in their political influence, religious prejudice, political interests and commercial rivalry combined together to destroy them. “On this occasion our persecutors sought to justify their violence by accusing the saints of enormous crimes, and the most astounding corruptions. That these accusations were utterly unfounded is clearly shown by the fact that with courts, jurors and prosecuting officers con­stantly and assiduously selected from among our persecutors, few of the saints were ever pros­ecuted on criminal charges, and very few indeed ever convicted. “That the best informed and most intelligent men of the nation are fully aware of their entire innocence, is shown in the fact that territorial government has been organized under an act of Congress, possessing as full powers as any other territorial government can, organized under the jurisdiction of the United States; giving its entire executive and legislative power to the same people then exiled; and the men among them who exercised most influence and control in their affairs, and who if they were criminal were most guilty, have received the offices of Governor, Marshall and Secretary of a Territory, as well as numerous minor appointments under the United States government both Whig and Democratic administrations. “The very high character given them by Senator Douglass who presided over the criminal courts of the Mormon District of Illinois, during the period of their sojourn there; by Col. Kane of the United States army; who witnessed their expulsion; and Captains Stansbury and Gunnison, of the Topographical Engineers, who spent a year with a large body of them in their new mountain home, have dissipated all suspicion in the minds of intelligent men that they had given any occasion for the harsh treatment which they received at the hands of the people of the State of Illinois. “The unequivocal testimony of Thos. Ford, Governor of Illinois, at the time of their expulsion, who was present most of the time at the scene of action, is that their character and conduct were far better than those arrayed against them. “Nevertheless this persecution was carried on until our fellow servants, the prophets, Joseph and Hyrum Smith, were martyred; the houses of hundreds of the saints burned down before their eyes; the entire community amounting to 25,000 banished from that section of the State, and four millions of dollars worth of property sacrificed. “After the banishment of the Saints from Illinois, a few of them came into Michigan, and commenced settlements on the Islands of the Great Lakes, then uninhabited, but occasionally occupied by roving borderers, engaged in fishing and selling liquor to the Indians, in violation of law, and in criminal courses still more reprehensible. “The attempt to build up permanent and populous communities in the midst of these valuable lake fisheries, especially at Beaver Island, where there is an excellent harbor, and every facility for an extensive and prosperous commerce, excited the jealousy of those who at Mackinac had for a long time monopolized the entire Indian and fishing trade. “The wretched men of the borderers who had sought a home beyond the haunts of civilization, that they might indulge in unrestrained debauchery and enjoy impunity in crime, could only regard settlers who sought good order and legal government as invaders and enemies. They early exhibited a hostile disposition, and a determination to prevent the establishment of legal government. “As early as 1849 we were subjected to numerous injuries, for which it was impossible to obtain redress. Women were insulted, and men assaulted with impunity. At the same time a concerted effort was made throughout the lake country to render us infamous, by telling false tales upon us. The numerous whiskey dealers on the fishing grounds, whose entire income was derived through criminal means, joined by most of the merchants at Mackinac, who were most seriously alarmed at the growing up of a commercial rival at Saint James, engaged in the undertaking and enlisted the officers and men on nearly all the boats and vessels in the upper lake trade, by means of their acquaintance with them. Every manner of false tale was thus continually put afloat, and no matter by what falsehood originated, was circulated through respectable newspapers, on what was taken for good authority. “By such means, in a short time the mass of the public were persuaded that the Saints at Beaver Island were the offscourings of all things, and the dregs of the inhabitants of the earth. “Under these circumstances, with no means of becoming generally known to the public, except through the representations of those thoroughly enlisted against us, in 1850, extensive preparations were made throughout the fishing region for an armed assault upon us, by a force more than four times as numerous as we could furnish for defense. The Saints were thoroughly schooled in the practice of nonresistance, and were unarmed. “But by the prophecies and commandments, it appeared that having three times fled before their persecutors, it was now our duty to withstand them, and that in doing so God would give us the victory. We resolved to repel force with force, and return blow for blow, and stroke for stroke, publicly announced one determination and prepared for the issue; and our enemies gave way without bloodshed. “In 1851 they succeeded in enlisting the United States government in a violent and lawless crusade against us, in the course of which immense quantities of private property was seized, and taken from us; numerous individuals were arrested on charge of felonies and misdemeanor of almost every manner, and carried prejudged and foredoomed, to distant places for trial, in the courts of their enemies; the United States military and naval force was put in requisition to awe our families in the absence of nearly all the men, while numerous armed bands of our persecutors were left to roam undisturbed through our settlements, taking and destroying what they pleased, and insulting and assaulting when they would. “From all these perils God delivered us. Every one of the accused were acquitted. Though numerous persons were assaulted and cruelly beaten, every one recovered. Only a small portion of the property which had been taken from us was ever restored; but the justice of our cause was vindicated by the decision of the proper officers that we were entitled to all of it, and the actual loss was by the outright stealing of public officers. “While these acts were going on, a few people from Mackinac, and a numerous horde of border ruffians, sometimes under pretence of legal process, but oftenest by mere force of arms, seized nearly all the movables of value possessed by our population. For these acts we pursued many of them at law to final judgment, who have abundance of executable property, but in very few of these cases have we been allowed to make collections on executions. “This persecution resulted in separating our enemies from among us, and leaving us the undisturbed occupancy of a territory sufficient for our use for many years to come; and at the next session of the Legislature acts were passed for establishing the necessary municipal authorities in that territory, organizing town and county government, and a regular judiciary. “Irritated at this, and suffering a great loss of trade by our growing prosperity, the people of Mackinac set on foot an armed invasion, for the avowed purpose of resisting all legal government in the county of Emmet, a purpose not concealed, but declared in the resolutions of their public meetings, and published in the newspapers. “A conflict ensued in which several of the Saints were wounded, and several thousand dollars of property destroyed; but the invasion failed, and the invaders fled as the wicked often do, when no man pursued. The criminals engaged in this invasion were duly indicted, but by the connivance of officers and citizens they were able to escape a trial and have gone unpunished. But their flight from this region left us in the enjoyment of peace and undisturbed order. “But the action of the State Legislature, at its next session in cutting up the county of Emmet, legislating its officers out of office, and denying a judiciary to the new county of Manitue, indicated a settled determination to deny us legal protection, and secure from punishment those who had committed crimes against us. “For all these wrongs the laws and institutions of the country offer us no redress. It is vain to answer that such acts are contrary to law, and that the courts are open to us. There is a law in the land stronger than statutes–more potent than the usages of courts. The will of the masses, however vicious and partial, no matter by what influences produced, has been able to trample on all precedent, and ride down all law. It has done more. It has produced legislation according to its wishes, in violation of all constitutional securities; and not merely contrary to precedent, but destructive of natural right. “This unrecognized law, found only in the will of the masses, has been enforced in destroy­ing houses, offices and valuable papers of some of the most distinguished citizens of the coun­try, public buildings of various kinds, printing presses and rail roads owned by wealthy com­panies, churches and convents of the most ancient and numerous religious denomination in the country, and to overthrow contracts which had stood the vicissitudes of two hundred years, the ordeal of civil war and national revolution, though defended by the sanctity of constitution­al and statute law; usages older than the language we speak; the power of a great State; the wealth that seven generations of thrift had accumulated; and backed by an aristocracy made honorable by deeds of benevolence, justice, patriotism and valor as boundless as the sources of its greatness. “If these cannot resist the power of this new element of national and state government mob law, how shall we? We are aware that our name is cast out as evil, as a kind of apology for the uncounted injuries which have been heaped upon us. But you will not forget that in ear­ly times among all the most polished nations the name christian was looked on as a name for fanaticism and debauchery; that the learned Greeks and victorious Romans held them canni­bals, and that, even now, in half the civilized and christian nations democracy is considered synonymous with anarchy and lawlessness–how justly, you can judge. “And if the sanctity of the ancient christian faith, and the greatness of your nation have not protected them from these aspersions, what shall protect us from equal wrongs? We protest against this nearly universal practice of assuming that we are guilty of great crimes, as an excuse for denying us the regular protection of the government in our legal rights. But when we examine the evidence of the truth of these assumptions, they are most conclusively falsified. “Joseph, the martyred prophet, whose blood stains on the jail at Carthage are as indelible as those of Jesus on the cross, has been arrested thirty-nine times on criminal charges. Thirty nine times he has been tried in the courts of his enemies; many times at the bar of men who advocated his murder. And thirty-eight times, in such courts, at the bar of such men, has he been acquitted. “The only offence of which he was ever convicted is that of unlawful banking–an offence committed with impunity by other men in nearly every State in the union. Nor did he escape conviction by the testimony of his brethren. Such men would stop their ears against it. If this is not a sufficient vindication of him as a law-abiding man, no array of facts could be. “That the charge on which he was finally arrested and imprisoned was merely trumped up for the purpose of seizing upon him and detaining him till a convenient time for his destruction, is as clearly proved as any fact whatever in the history of the country. “And when we add that his murderers were indicted, arraigned and acquitted at the instance of their own friends, without any attempt to introduce the necessary evidence against them, and merely for the purpose of interposing a legal bar to their punishment, in some more healthy period of the public mind, we think it will not require argument to convince all mankind that, the State of Illinois has adopted that murder as its own. “In this place, during the persecutions of 1851, ninety-nine men were arrested on false charges, taken to distant places and tried in the courts of their accusers, and though prejudged and foredoomed, were every one of them acquitted. “For all these wrongs we are denied redress. We have not forgotten that there are tribunals in which causes partially similar in kind, immeasurably less in aggravation, are sometimes examined, perhaps occasionally righted. But these tribunals are closed against us by the law now, and at all times by the power of that law already referred to, which is above statute, precedent and right. “If a period cannot be put to these wrongs, then there is presented to the world the melancholy spectacle of the greatest republic on earth, a christian nation, acknowledging itself powerless to judge; unable to protect the right; a nation on whose righteousness half the earth rest the hopes of man, confessing that there is a power above the law, riding down the constitution, which stalks abroad to plunder and banish the citizens, and none to rebuke; murders the unoffending innocent, and none to say, “why do ye so?” which sancti­fies its deeds of violence, even in the eyes of religious men, by blackening the fame of the glorious dead, with the name of crimes which in their life time it dared not attempt to prove, even in its own tribunals. “The administrators of the government have been appealed to in vain. Unless the wrongs redressed, they must rest on the nation forever, and bring down the wrath of God on those who have done, and those who have permitted them? If you fear not God, how will you answer to man­kind and to posterity, for such a desecration of republicanism, in a christian country. “For all these wrongs we do not ask a grant of lands, nor a State or Territorial government–We acknowledge that we have had enough of these. We shall never sell the lands of our brethren and ourselves, the inheritance of the martyred and of their children, for new grants of which we are equally liable to be deprived by some new act of violence. “There is now in the States of Missouri and Illinois four millions of dollars worth of houses and lands purchased with the money and produced with the skill and industry of our brethren the saints, which they are not permitted to occupy. “Courts, State Legislatures, and State executives are deaf to us. When we speak, they cannot hear. When we ask justice, their faces are turned from us. True, when they do speak, their voice is for us. But it comes after the deed is done, or it is so faintly heard that the lawless do not think it earnest. The forms of law hold us as victims, and the power that is above law overwhelms us. Thus have two of our prophets died in the hands of public officers, and under the destroying protection of a State Governor, personally superintending the proceedings, and no one act of public indignation has rebuked the deed. By every form of .judicial proceeding known to the laws of the land, the perpetrators have been legally shielded from the punishment which the law itself denounces against such crimes. “The fact that our brethren are the owners of large tracts of land, purchased of the United States, and secured to us by the name and seat of the President, which they have never sold, and which they are not permitted to occupy, by the powers actually existing, and that our brethren have been banished and murdered, and their persecutors are unrebuked, and positively and legally screened from punishment, is as indelibly stamped on the history of the country as the declaration of independence, or the victory of Buena Vista. “We do not ask compensation in money or land for the blood of the dead, or the persecutions of the living. The lands we have been robbed of, we shall continue to claim for the banished, and for the widows and orphans that murders have made, till the day when the judgment of God shall be revealed on the nation, and his wrath no longer slumbers; and they shall go up and possess it, though the nation ceases. “But these things admonish us that we are not to expect peace or protection in the midst of the people who have done us this iniquity. Both by the commandment of God and from the necessity of our situation, we are seeking a home in a land where religious sects and political parties are far removed from us, a land uninhabited. “We have not been suffered to live with other men. Shall we not be permitted to live alone? God made the earth for all men. Of the vast all he has given us a few little islands. They are the work of his hands; not man’s. Why should man sell God’s work? “For nine years our communities have dwelt here in peace among themselves. The few small schisms which have arisen, have yielded to the ordinary course of discipline, and the wrong doers have either amended or departed from among us, doing us very little injury, except as they were abetted by public officers, religious boobies, the newspaper press, and bands of lawless men. Yet we are pursued from day to day with continual threatening. An effort is continually made to convince us that we are to have no rest forever. “Three times have we fled before our persecutors, because we would not repel injuries by force. We understand by the word of God that it is our duty to flee no further. We do not learn from the divine writings that it is our duty never to resist evil deeds.—The time has come when forbearance is no longer a virtue. “While men around us have for years threatened us with fire and blood, and we only asked legal justice, they have been continually commended for the forbearance, and we continually menaced with invasions, expatiation and death. “We have ceased to take to ourselves any trouble about these matters. We have known for years what our persecutors seem so anxious to impress upon us, that, when the public vengeance is waked up the law will not protect us and that among an angry people innocence is no shield. “We do not expect Governor or President to protect us against mobs. We live in the continual assurance that any one of us might be murdered in a neighboring county, and not a magistrate could be induced to issue process against the murderer. “Yet we trust in God. We walk in conscious security. We laugh in bitter scorn at all these threats. And we tell these wolf hounds, marshal your myrmidons, and send them along, to make a spoil of beauty and booty, as soon as you please. We bid them a bloody welcome to hospitable graves; over which, each year, we will pile stones, with a muttered curse, against the day of the resurrection of damnation. “We will neither purchase temporary peace and future calamities by dishonorable trafficking with political jugglers, nor will we yield our homes to enemies. If we live, here will we live. If we die, here will we die, and here shall our bones be buried, expecting in the resurrection of the just to possess the land forever, and dwell with the righteous during the lifetime of the Eternal. “God judge between us and all men. The gate is still open. James J. Strang ordained L. D. Hickey one of the twelve Apostles, who ordained Samuel Martin a High Priest, who ordained Lloyd Flanders a High Priest, who ordained me an Elder. Here is a truly special invitation. The kingdom of heaven is at hand (within your reach). Repent and be baptized in the name of Jesus Christ for the remission of sins; and you will be born of the Spirit, receive the gift of the Holy Ghost, and enjoy all the blessings prepared for saints of God. You are invited to go with us.